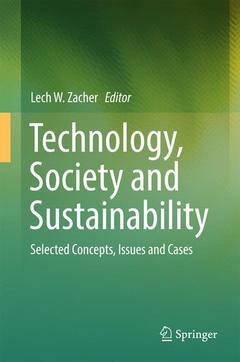 Coordonnateur : Zacher Lech W.
This collection is a multidisciplinary and multicultural contribution to the current sustainability discourse. It is focused on two main dimensions of our world: complexity and diversity. Desirable and urgent transition of socio-technological systems toward a sustainability trajectory of development requires a better understanding of technological trends and social transformations. General advancement of technology does not produce identical changes in various societies, differentiated economically and culturally. Moreover, the abilities to approach sustainable development change over time and space. As a result there is a constant need for continuing research, analyses, and discussions concerning changing contexts and adequacy of strategies and policies. Authors from twelve countries and of different academic and cultural settings present their insights, analyses and recommendations. The collection is focused both on contexts and on activities leading to sustainable trajectories in various domains of economy and social life. Continuing research and discussion is needed to better understand these challenges and to prepare the appropriate strategies and solutions. Development of socio-technological systems is nowadays very complex; moreover, the world we live in is extremely diverse. Therefore, sustainability discourse must be ongoing, introducing new ideas, concepts, theories, evidence and experience by various parties?academics, professionals, and practitioners. Part I. Technological Developments – Civilization - Policies.- Chapter 1. Diffusion of Innovation in Social Networking (Karol I. Pelc).- Chapter 2. The Architecture of Sustainability-oriented Enterprise and Civilization (Andrew S. Targowski).- Chapter 3. Technologization of Man and Marketization of His Activities and Culture of the Future (Lech W. Zacher).- Chapter 4. The Digital Agenda of the European Union and The Digital Policies of the US (Despina Anagnostopoulou).- Part II. Some Applications.- Chapter 5. Social Justice through Adhaar : An e-Policy Initiative (Anarug Kumar Srivastava).- Chapter 6. Audiovisuality of the Third Degree – Reality or Fantasy? (Tadeusz Miczka).- Chapter 7. Digital Preservation of Cultural Heritage (Nonja Peters). Part II. Impacts on Societies.- Chapter 8. The Peril and the Promise of the Internet Technology for Future Social Order (Alina Betlej).- Chapter 9. The Citizen in the Cyberspace: Should There Be Any Limits to the Freedom of Speech in the Internet? (Joanna Miksa).-Chapter 10. Progress in Science and Technology vs Threats to Civic Liberties – Selected Issues (Ewa Polak).- Chapter 11. Impact of ICT on the Law (Małgorzata Skórzewska-Amberg).- Chapter 12. Legal and Moral Dilemmas of Targeted Killing by Drones (Wojciech Lamentowicz).- Part IV. Technology Evaluations and Policies.- Chapter 13. Technology Assessment in Systems Analysis (Piotr Sienkiewicz).- Chapter 14. Technology Assessment and Policy Advice in the Field of Sustainable Development (Armin Grunwald).- Chapter 15. Cooperation with Middle and Eastern European Countries in the Field of Technology Assessment – Results and Experiences. A Short Overview (Gerhard Banse).- Part V. Approaches to Sustainability – Some Examples.- Chapter 16. Sustainability as Growth (Tsvi Bisk).- Chapter 17. What Can We Do Better for Sustainability in an Uncertain Future? (Li Xu).- Chapter 18. Economic Prosperity and Sustainability in China: Seeking Wisdom from Confucianism and Taoism (Xiumei Guo).- Chapter 19. Threats to Sustainable Development (Andrzej P. Wierzbicki).- Chapter 20. Sustainable Development – Sustainable Man (External and Internal Conditions for Sustainability) (Wiesław Sztumski).- Part VI. Sustainability – Dimensions and Issues.- Chapter 21. Embedding Sustainable Development in Organisations through Leadership: A Conceptual Framework (Emiliya Stoyanova).- Part VII. Sustainability – Practical Orientations.- Chapter 22. Can the EU Sustainable Consumption and Production Action Plan Realize the Sustainable Development Principle? (Joanna Kielin-Maziarz).- Chapter 23. Implications for China’s Resource Demand on Sustainability in Australia (Jin Hong).- Chapter 24. Integrated and Sustainable Approaches to Address City Inundation in China (Baohui Zhao).- Chapter 25. Nano-biotechnology for Water Sustainability: Bibliometric Analysis (Li Xu).- Part VIII. Sustainability and Business.- Chapter 26. Stakeholders’ Strategic Thinking for Sustainable Development (Anna Czarczyńska).- Chapter 27. Generative Dynamics: What Sustains the Creation of Shared Business Value (Massimiliano Monaci) .- Chapter 28. Sustainability and the Firm – From the Global to the Corporate Ecological Footprint (Luisa Soares).- Chapter 29. Sustainability and Public Finances in the Time of Austerity (Noel B. L. P. Gomes). Prof. Lech W. ZACHER is an economist, sociologist and futurist. He is Director of the Center of Impact Assessment Studies and Forecasting at the Kozminski University in Warsaw, where he also is a member of the Chair of Social Science. He is a member of the Futures Research Committee “Poland 2000 Plus” at the Presidium of the Polish Academy of Sciences. He is the Vice-Chairman of the Polish Association for Technology Assessment, and the Founder and President of the Educational Foundation TRANSFORMATIONS and Editor-in-Chief of its interdisciplinary journal “Transformations” (published also in English). He is a member of several scientific societies (e.g. International Sociological Association, European Assoc. for the Study of Science and Technology). L. W. Zacher is the author, co-author and editor of more than thirty books and of three hundred articles (more than a hundred in English) concerning science-technology-society problematics, information/knowledge society, globalization and the future.